I love it how you have to go hunting around the net to find solutions to all the annoyances of Windows XP. Here’s my latest find. Anyway, the tip I linked to above fixes it in one swift move. Finally! 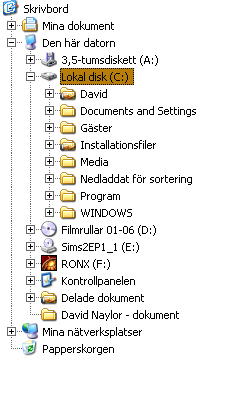 Some time back I created an empty text-file on my desktop, and renamed it .exe – all in the name of science. I simply wanted to see what would happen if I tried running it. Well obviously, nothing but an error message happened when I tried running it. But then I wasn’t able to delete it. For some reason the fake .exe was blocked, or used, by some process. After doing a fail-safe boot and trying again, as well as booting into Ubuntu and trying to delete it from there, I gave up. Start the command prompt, either from the programs menu or by clicking [Start] > [Run] “cmd”. Start the task manager by pressing Ctrl+Shift+Esc. Shut down explorer.exe from the “Processes” tab. Just read about this free, downloadable Star Trek parody named Star Wreck. Haven’t seen it yet, but my Azureus is working hard to get it for me as we speak. I’ll post an update with a short review later. I found a great (freeware) program which lets you check your CD or DVD backups for errors – CDCheck. I was having a bit of trouble with my DVD writer, so this was just what I needed to be able to check that my burns were fully readable. Sony have a new tv commercial out now which is really cool. They poor ~200,000 coloured super balls down some streets in San Francisco. There are great behind the scenes shots and a photo gallery. Edit: Found a flickr set of photos from the shoot. I noticed my blog feed wasn’t working properly since I moved it to davidnaylor.org/blog. Anyway, now it seems to be working again. Let me know if there are any problems. Does Safari Support Soft Hyphens? Does anyone reading this know if Safari now has real support for soft hyphens, i.e. &shy;? Posted in browsers, Uncategorized | Comments Off on Does Safari Support Soft Hyphens? Since I have gotten myself a shiny domain name and webspace I will be moving this blog over there, to davidnaylor.org/blog. So unless anything unexpected happens, this will be the last post here at naylog.blogspot.com. I was trying to download the two Debian DVD images using Azureus, but it kept saying my hard disk was full, or sometimes just error . Since I had over 80 GB free, I knew this wasn’t the case. Googling for people with the same problem didn’t really give very much at first. After a few tries though I found out that FAT32 can’t cope with files larger than 4GB. Apparently Azureus can’t tell the difference between having the wrong type of file system and having too little space left on the disk. I guess windows returns the same error code. I solved the problem by creating a 20 GB NTFS partition for my larger downloads, using Partition Magic. Normal is getting dressed in clothes that you buy for work and driving through traffic in a car that you are still paying for – in order to get to the job you need to pay for the clothes and the car, and the house you leave vacant all day so you can afford to live in it. I had once again summoned up the energy and courage to try to install Linux on a second partition of my C drive. Having tried this about six months ago, I had the basic routine fairly fresh in my mind. (My previous, and first ever, try, failed because I couldn’t get the network to work. This time I seem to have that bit covered anyway.) So, I downloaded Kubuntu 5.10 for AMD 64, did all my backups and created a nice shiny 25 GB partition on my C drive as well as a 512 MB Linux Swap partition. So far everything had gone fine. I activated the new empty partition, slipped the Kubuntu DVD into the drive, rebooted and hoped for the best. All went well until I got to the partition manager of the installer. Even though I had specifically created an empty Ext3 partition as well as a swap disc, the installation’s first suggestion was to wipe the whole 200 GB drive. How intelligent is that? Well, anyway. I chose the Configure boot table manually option and tried to get some kind of confirmation of that it would install on the new partition and leave my Windows partition alone. There was none. But there was a little flash symbol next to the partition I wanted to use, so I guessed that must indicate the active partition (which I knew it was) and also that it would use that partition for installing. Only, while I was dodging back and forth between the screens, not knowing what to do, the big fat excuse of an installer hung on me. After having booted up Windows, checking the download wasn’t corrupted (using md5sum) and remade the DVD – I tried again. Still the installer kept hanging on me, at one stage or another. The furthest I’ve got so far is to Configuring apt – Testing network repository… . Even if I get through all the prior steps, it always hangs there. I must have tried the whole procedure six or seven times now, and I’m pretty much getting fed up. If anyone knows how I can bypass this step, or make it not hang I would be very happy for any ideas or suggestions. If all Linux distros have this bad installers (which I doubt they do) then it’s no wonder that Linux is a geek thing and a geek thing only. 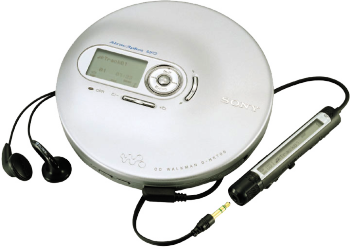 This product has been manufactured for playback of discs which adhere to the Compact Disc (CD) standard. Recently, some record companies have started selling Audio CDs with digital rights management. Please note that these discs do not adhere to the CD standard, and therefore may not be playable on this product. No. I’d say that with time, Sony will realize that you don’t get any business if you keep trying to control your customers’ every move. The customers will go to the company that gives them what they want. At the moment Sony is giving them the exact opposite. Distances adjusted slightly and underlining removed from the links in the navigation columns, to improve readability. Navigation columns and their margins made slightly wider. Trebuchet MS ditched as the text font and replaced it with Verdana, which looks better at many different sizes. Default text size reduced slightly (10%). Increased the line height sligtly for paragraphs. Put a photo in at the top right. Pulled the blog heading in a bit from the edge. Put those little pixelart badges in the right hand column. Over in this thread at Hydrogen Audio it has been established that Winamp’s equalizer, when switched on and tweaked, degrades any MP3s you play. This is because Winamp by default uses some EQ method for MP3s which (if I’ve understood things correctly) uses less resources, and affects different frequency ranges. The difference is pretty obvious: Compare a good quality (220kbps +) MP3 to it’s original Wave file. If you have the higher bands on the EQ turned up a few notches, the MP3 will sound much poorer than the Wave – even though the sound information contained in the MP3 at this quality level should be pretty much indistinguishable from the original. Select the Nullsoft MPEG… input plugin and click [Configure]. Select the [Decoder] tab and uncheck [Fast Layer 3 EQ]. That’s it! Enjoy your MP3s as if they were Oggs! Last week I bought myself a new screen for my computer. 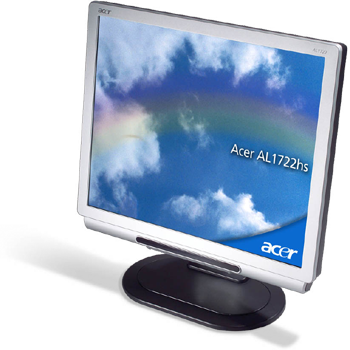 I went for an Acer AL1722hs. (High-res photo.) It’s pretty neat. It has the ability to pivot, which is great for basically everything except gaming, and possibly film-watching if you’re into that kind of thing. It’s big (enough, 17″), responsive (8ms), bright (300 nits) and has good contrast (700:1). The native resolution is 1280×1024, which means you get loads of webpage on the screen in one go when the screen is pivoted. If you’re about to buy a 17-inch flat screen you may have thought about the fact that the 1280×1024 resolution doesn’t have the normal 4:3 ratio – it’s 5:4. I was thinking about this before I bought it, and was wondering if that wouldn’t mean that the image would be skewed. Anyway – no need to worry: the physical dimensions are also 5:4, so a circle will still be round. Furthermore, it’s adjustable in all thinkable directions, which makes it easy to find your optimum position. Overall I’m very satisfied so far, except for one small thing: It seems when the screen is in it’s normal orientation it’s difficult to get it exactly straight. The stopper which stops you from rotating it anti-clockwise cuts in a degree or two too soon. Is the iAudio X5 the DAP of My Dreams? Well, it’s pretty close at least. It has good, solid Ogg support – at least from what I’ve read over at Hydrogen Audio. It has a nice colour screen. It has radio. It has 20 GB. 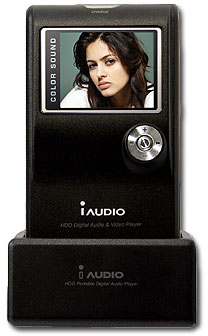 It can record (to mp3) on-the-fly, with a small built-in microphone, from the radio and from the line-in connection. It doubles as a portable drive. And it can show video and photos. So what does this beauty cost? Well, here in Sweden the best price seems to be SEK 2,790 + about 99 for delivery, which would equal about $414. It must sound pricy to those who live in the US, but I guess electronics in general are more expensive here. The only problem now is – when would I use it? I don’t tend to use the portable players I have all that often. Also, I’ve just spent ~$400 on a shiny new screen. Posted in Uncategorized | Comments Off on Is the iAudio X5 the DAP of My Dreams? I’ve been wanting these for ages (and they may have been around for ages too) but I didn’t find them until now: Audio Plugins for Nero which let you drag and drop Ogg Vorbis files (and others, including FLAC & MP4/AAC) straight to your Audio CD compilation. This has been bugging me for ages: The folders in Windows XP auto-expand when you click on them in the folder tree of Windows Explorer. Finally, thanks to this page, I have learnt how to disable them. How’s that for a technical heading? For those who are not really into ABX-ing: It’s the art of comparing a compressed sound file with it’s uncompressed original. The point is to find out for yourself at what quality level you have to set your MP3 or OGG encoder to not be able to tell the compressed song from the original. Today I encoded a certain song (Green Day – Wake Me Up When September Ends) with the V1 quality setting of the Lame MP3 encoder, which for this song gave an average of 241 kbps. That means I must have pretty decent hearing after all. Which is strange, because it was my hearing which got me out of the involuntary Swedish military service.